Madden NFL introduces exciting new ways to team up and play with friends this year, in Madden NFL 18. Check out all of the new gameplay features including target passing, blocking controls, new wide receiver and defensive back mechanics. Madden 18 also features three ways to play, arcade, simulation, and competitive. Pick your style and play your way. Madden NFL 18 launches on August 25. Pre-order today and receive three days of early, full-game access to Madden NFL 18: G.O.A.T. Edition, only available on PlayStation 4 and Xbox One. Those fireworks at the beginning. Wow. Even though it was quick. That Bills intro is correct. Bills got some love this year. The target passing icons are uglier than I thought they would be. Wondering why there is 2 different ones? Lob and bullet pass? Hopefully we don't need to have those on-screen buttons for the total pass control. I like the coaching adjustments, time will tell how effective they are and if they can backfire. Didn't see those Passing icons at EA Play. Tom Brady's throwing animation is spot on. Couldn't see the ball release point though. Need to see more. What I was thinking. There's a lot of **** on the screen at the same time. I assume some of this can be turned off. Could be extra visual assists, maybe arcade mode? I could see a less visual experience icon in simulation modes. I hope the game actually looks like that when it releases. Julian Edelman's catch animation was pretty sweet too, one of the more true to life animations I've seen in Madden. I'm not so sure that the difference in simulation modes is a visual experience change. More behind the scenes isn't it? Exactly what i was thinking. How much of the engine footage vs the real thing. So do we have team intros like Madden 12? And I'm glad they got shooter sleeves in there. Did you see the disclaimer at the end where it said "Captured in Engine, Representative of Game Experience"? I mean, you're not going to notice it being that detailed when you're in God-camera mode looking down at all 22 players, but on the between play scenes it should look like that. And there we go, it looked nice. Good for a trailer....ready for blogs/gameplay vids next! Was thinking how in the past they've done a bait and switch. Madden 06 360 trailer comes to mind. I know frostbite is very powerful and battlefield and front very closely resemble their respective trailers. I'm worried on past history with ea sports and their trailer haha. Not to be picky or anything, but it looks really strange on the player run outs when a player comes out of the tunnel and they are literally the only player on the field. No other player lines to run through, and not one other player standing anywhere in or up the tunnel. Looks good. I would think all the icons and visual cues can be turned off. The EA sports games have been like this for the past few years now. When you first play NHL they have a bunch of visual cues and assists that are mostly for beginners or to help teach new mechanics. Not too worried about that stuff. Can't wait to hear more in depth info about all this. What are the details and differences for arcade, simulation, and competitive? How exactly will the new QB mechanics work and how will QBs differ from eachother (hoping for some type of signature passing animations). What and how will the new wr/DB interactions work and play out? Very excited for Madden this year. Should be the best yet. I've got 4k HDR on my OLED as well - excited for it on PS4 PRO! The reach sack on Luck was great. Really liked that. Graphics look incredible. Love the detail and the lighting. Disappointed to see striped socks still have no variation. Sherman's face looked terrible to me though. Not sure why they chose to showcase that, lol. Also liked Mccoy's strut into the endzone. Looked awesome from the little clip. Eli's dropback also looked really good. Pocket around Brady was nice and it was nice to see him look like he was actually scanning the field. Back shoulder catch by Edelman was sick as well. Really liked the fluidity between the WR's and DB's. Lineplay on the Dak throw looked nice too. Yup, 65 LG B6, bought in anticipation of Madden on the Xbox One X, cant wait! Yea I thought he looked like a demon. I thought it looked awesome. Need more game play though and less razzle/dazzle PR quick-cut video stuff. I know in Tyrod Taylor case, there are no players on the field, maybe this is the case where the QB comes out first, followed by the rest of the team lol . That's an awfully optimistic outlook. Can we criticize something that's clearly lacking? Couldn't afford to go OLED, but my x900e is ready and waiting for this bad boy. Broncos / Panthers clip in this Carolina has on ''black'' socks with the away uniforms, should be the ''panthers blue''. How often does EA update the stadiums? The Seahawks stadium is wrong because the upper level is supposed to have LED boards wrap around the stadium. It was added to CenturyLink Field last season. Could it be a playaction pass and he is just carrying out the action? I am not excited for this game. It looks like the same Madden but all gimmicks. The run outs are cool but there's only one player on the field. It looks like a cutscene instead of real time like other sports games. He would still have the ball and there is no RB that I can see. Yeah...so since target passing is an online tourney type stick skill feature (and hey nothing wrong with that it looks cool) and throws QB ratings out the window......it will be the same old Madden passing system for me on 18. And they have improved passing a lot since M25 with touch, over the shoulder, low and hard, using the RS. So it's not bad. But I really wanted off the rails passing but ratings being the driver. And also.....I like playing with a totally clean screen....so there is that too. Still.....looking forward to next month and getting going on Madden 18. Visually it looks like it will be eye popping and a nice upgrade from 17 on my PS4 Pro. New coaching (NCAA stuff I know) adjustments are very welcomed too.
. New coaching (NCAA stuff I know) adjustments are very welcomed too. Those clips were crazy quick. Hard to take away too much. The QB annimations looked good to me though. What little you could see. I bet the target passing multiple icons has to do with difficulty settings. The red icons are for the easy setting to let you know when throw the pass and at harder levels you will only get the orange icon. Looks excellent. Like the Richard Sherman finger wave. Eli's looked good too. Overall I liked what I seen in the trailer. Small gripe and I know it will never happen...but I wish Dez could get his tats. Noticed nobody outside, on the concourse or ramps of stadiums in the sky arena intro cams from E3 trailer as well. But still there is a little time for details like that. Def like the graphics. Not sure if this is 4k though. My gut is saying Xbox one and PS4 . But overall the lighting and textures look much improved from M17. Icon passing I'm not sure of. Will have to play to see how it feels. Game Definately looks like an upgrade from last year which is something you don't really notice in past madden games. M15, 16 and 17 all had the same graphics and it was hard to differentiate what year it was without subtleties like updated cleats, etc. This year you can clearly tell ,which is a nice thing to see. It looks like from the little I could see the run animations look better which is a pleasant surprise. Looks like shooter mcGavin fixed the three quarter sleeves! Man those screenshots look lifelike! Overall it looked nice. I wish I could see some raw gameplay, but these are two things I noticed that I really liked and did not. 37sec mark: JJ Watt muscles his way deep into the pocket and manages to pull down Luck with a free hand while still having the O-lineman on him. Awesome. 16sec mark: Dez dives for the ball and the linebacker tackle animation that prompts is to stand Dez and "fight for extra yards". Terrible showcase of physics and animation blending. Dez should've been knocked to the ground. This is my only MAJOR gripe is animation blending and physics working together right. Note: I watch videos in 0.25seconds just so I can see whats going on with all these quick cuts and zoomed in shots. I don't put much stock in trailers, especially from Tiburon. That being said, there are two things that I have absolutely HATED about Madden since its inception. While there are still no stunts (which is still a massive disappointment), the line play looks more like what I was expecting from M25. I'm sure we will still see the lineman who block nothing and stare off into space on occasion, but I saw some things that I've been clamoring for. The reach sack on Luck was great. I really liked the QB drop backs and some of the interactions. Madden, IMO, has always been absolutely awful in motion. Hopefully they will be stepping this area of the game up significantly. As usual, top notch work from the art team. Graphics look great. Looks good but I've learned over the years to never get too hyped off of a trailer. I just hope the Player Physics are cleaned up before & especially after the play when players are getting up from tackles. I don't want to see players walking right through the QB's body when breaking the huddle and walking to the line of scrimmage. I don't want to see players walking through other players bodies lying on the ground when getting up from tackles & pile ups, limbs fusing together etc...All immersion will be lost if this isn't cleaned up. Player Physics are great during the play but it needs to be consistent at all times. so the orange football icon is where the football is going to be. The faint blue icon is where the the player is going to be. Clearly the ball is behind Edelman by the correlation between the two. Hopefully there just trying to showcase the target passing feature in the trailer. There's no way to display it at all without the on screen buttons. Does in engine footage mean those visuals were created in engine so they were able to take out things like the sideline and the crowd to make them look better? What's the difference between in engine footage and actually gameplay footage? On Tyrod Taylor it looks like the added single three quarter sleeves. Loved the catching animation.......but......I have a problem that the ball was thrown behind him with a closely trailing DB and the DB didn't come away with a knockdown or INT. Hopefully that catch is from another play because looking at the first screen that Brooke posted, the ball was targeted at what looked like just inside the 5 yard line yet where the ball is caught in the second screenshot is in the endzone. Good eye. I know equipment isn't important to most but it really helps me with the longevity of the game, hoping they added more new equipment but if it's only real shooter sleeves and the ability to edit each sleeve individually a la NCAA football I'll be happy on that end. It simply means its in-engine and not in-game. Basically it will not look EXACTLY like it does in this trailer. With that being said, Frostbite has translated flawlessly to actual gameplay so we'll see. Sherman's dreads look a little better. The Matt Ryan dropping back with no ball in his hand bugs me. People were asking last night in Sim's YT stream why we needed gameplay early? Maybe it was just a replay issue? Maybe not, but it would be nice to get this patched in as fast as possible which is the reason for having gameplay videos early so we can critique them and let Rex or Clint know about them. I think it might be a "game engine footage" issue. I think a lot of those cut scenes aren't pulled straight from gameplay or gameplay replays so bugs like that might be more common. Andrew Luck also has what looks like a red captain's patch when Watt sacks him. I'm sure they can be turned off. Target passing looks complicated, but I still want to get my hands on it. Hopefully the UI can be toggled off once you learn it similar to the rest of the game. I just can't get hyped by this trailer. I don't feel this accurately represents the gameplay we're going to get. Honestly, I am a little nervous by how long it's taking to release footage. I mean, we'll have access to the game in just a few weeks. It is . I noticed on the icon image Edelman has blue cleats . And the closeup catching animation he has red cleats. This hold true for the Odel and Norman catch . Norman has yellow pants in one screen and maroon in the next. the trailer was pretty good and has me a little more hyped for the game - overall its about what I expected to see. the blogs will have more of an impact in my opinion. This is what bothered me about the "cutscenes" the past two years when the drives start. They aren't real time so the players are just at random spots on the field. Yea hopefully they can get it approved this late afternoon, otherwise could very well be Monday. You can tell Rex is frustrated at the end and I would be too. Both Brady's and Eli's throwing motion were spot on. I'm confused at your post bud. Definitely not spot on. Much better yes...but honestly I think there is something wrong with the limbs of the player models that throws something off with the animations. There was a pretty big thread about it awhile back. Going by what we saw in this trailer, already Brady's throwing motion was in fact spot on to how he throws. Kudos to Rex and "his" crew. I think the importance is definately seen on his part , but I feel there are exec levels that don't feel his passion or promptness to get things done. I see the players on the sideline still don't have names on their shirts. If they can have numbers, I don't see why they can't have names? It is just so weird though. For a company as big as EA they really don't seem to have structure in place. What they added looks pretty solid. However, I am very underwhelmed with the amount of changes from 17 to 18. I hope they haven't released all the features they've added yet, and am hoping for a nice surprise or two in the blogs. I am 99% positive this will not be an issue in the retail version. Probably a strange bug that no one noticed when they put together the trailer. Yeah, Brady's got his sig throwing animation, but Eli's was just the generic deep pass animation that's been in the game. Yup. Really curious about the target passing. I absolutely hate icon clutter. But, of course, they have to put something there. If it can be somewhat toggled, great. But, I have a feeling it won't. There has to be some sort of target to 'see where you're throwing the ball'. So, that's a tough one. Perhaps, when u get used to it, u might not notice it in the respect that it's going to be pretty fast action to pull the LT, get the icon, and move it a little if u want. Perhaps, after awhile, u just 'know' where the icon will be and then adjust. I tell u what would be great really is if u could toggle that sumbeetch, and still use it. Meaning, you'd have NO target to pass to, but what u would now have to 'feel' where the pass will go. Like a Jedi, u know? Yeah, I wanna rock the target passing like a Jedi, yo. That should be pretty challenging, I would think. But, would really give u the feeling of playing QB and slinging the ball around. Didn't care much for the trailer. Little to none of the footage was gameplay...and that song choice was awful. Meh. Madden 18 was a pass for me anyways. Don't want to get off topic, but where have you heard it will be in HDR? I've only seen 4k confirmed. Not every Xbox one x/ps4 pro game is HDR..
? Eli's animation looked new to me. Blog me need Blog. Well with that out of the way on to the video. At the 10 sending mark we have a decent pocket and cut block by the RT. 12 seconds I see arm fighting between the wr and CB. Diving catch looked good hopefully it wasn't the old warp catching. I say this because the DB was in position but didn't play the pass he just put a hand up. 0.17 no passrush by the Eagles although it was against Dallas. Same play very solid zone Defense, more aggressive zone play very tight windows. 0.18 same play LB did not play the ball. Actually, I think Dak had the best throwing motion. Very smooth. This is the first time I've came away from a Madden trailer and said that almost everything they showed was new and different. I thought the animations shown were very much improved. The catch animation by Edleman with the back shoulder throw and the jostle interaction with the push-off, could possibly be the best sequence I've ever seen in any football video game. The reach sack was also a thing of beauty, again something I haven't seen done to that extent in a football video game. When I saw the trailer earlier, I thought there would be a more positive impression from the community. I can't say I'm surprised because everyone knows EAs track record with this stuff. However, if they've added dozens of animations like the edelman and Jordy catch (not just 7 - 10 like we usually see), DB/WR interactions are realistic and consistent, and tackling and OL/DL interactions are truly overhauled - this will be in GOAT territory. This game is going to look amazing on my new LG C7P & the XOX. I think Manning's throwing style looks good....not the one that was already in game for what usually was a bomb. Here's hoping they have a lot of new ones and didn't remove any. Yup. I think Xbox one X comes out in November. So, it'll be like getting 2 maddens this year! Lol. . Sort of like getting a visual upgrade mid season. One of my nitpicks is why is Elliot and Dez skin color the same? This game is looking almost the exact same as Madden 17. But I'm hoping that simulation mode actually causes the game to work! In the past penalties would be called in bunches and were never organic or legitimate. So I'm hoping simulation mode makes this game worthwhile. In what way is it the same? In what way is it not? As far as how the game looks there is almost no distinction between 17 and 18. The only thing that I see really changed is the new gameplay styles. Which, if they work correctly, are supposed to change the way the game feels depending on what style you choose to play. Nah, the player models are different, the lighting is better and there are some improved animations. I mean I'm not gonna try and convince you to want to play the game but to me your statement discredits what EA they did this year. Out of all the improvements to the game the only thing you see thats different is the 3 different play styles? How do you know these are improvements or that they work at all based on a cinematic trailer? Not saying 18 is the same, but it's really hard to say EA really did anything major based what little info we have either. It basically comes down to whether or not you believe EA at their word. For me, that trust is spotty at best. I can't say if they will work but I can say these things have clearly been added. A new passing mechanic wether it works well or not has been added to the game. New DB/WR mechanics have been added to the game. The team has PUT this stuff in the game. Wether it works well or not was not my point. I just don't see how people can look at this game and imply nothings been worked on. The db/wr mechanics are mainly for MUT squads, the blog says as much right away. I don't play as a db or wr until the ball is in the air and I don't play MUT. I have similar feelings about the passing mechanic. No one in the handful of leaked vids has used it. I'm sure they've worked on madden 18. Will those changes affect me at all, much less warrant a $65 upgrade? I don't know. I haven't seen anything either way. I haven't seen actual gameplay. "While these mechanics were spawned for the Team Play style of MUT Squads, all are available to be used in all modes, including Franchise, MUT, and online H2H. Even the AI-controlled players will be using the mechanics, again based heavily on their assignment on the given play call and their relevant ratings to each situation. " How do you get it's only for MUT from that? A whole new passing mechanic has been added to the game and because it's not for you or you're not sure if it's gonna be useful, means people should brush it off? Again, I could go down the list of improvements but it's not worth all the time. If what they added to the game isn't for you, then cool. But to say it isn't gonna work or making it out like it's all a lie is not how I look at the game. Did I say they lied? No. But developers have always been known to oversell what a game feature will do. I don't take any of them at their word. I'd prefer to see it in action. I get it's only for MUT because I don't play as a db or a wr...like most people. It's available to use, sure, but if it requires playing as the wr then it won't be used when/if I play. I also never said anything about brushing off passing mechanics. Again I haven't seen them used so I can't make a judgement on whether or not it's an upgrade. You choose to read about something new for 18 and get excited. I choose to see it for myself first because my track record with madden in particular isn't good. When we see real gameplay I'll know whether or not 18 will improve my experience with madden. You're not wrong in your logic in this post. However this is a thread on the Trailer. 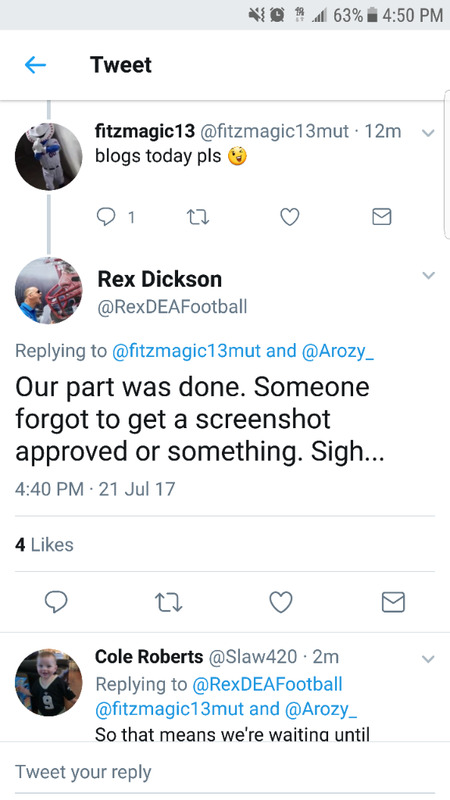 I simply asked how someone can read the blogs and watch the trailer with gameplay footage (limited I know) and say its the same as madden 17. The way I read the WR/DB blog, the mechanics are all for the AI players, too, in all of the modes. Am I wrong in interpreting that way? From what I read the AI will use it. Hard to say how or if it will affect the game based on the blog tho. To get the most out the feature, and the reason it was added; was for MUT squad where users play as dbs and wrs. It it works as advertised in the blog, then it should be a nice addition all the way around. Were there not several posts in this thread commenting on both Tom and Eli's throwing animation? Also Tom scanning the field in the pocket and Qb's keeping their body turned to their receivers. "Move the target: Use LS to move your target. As your target changes the QB will turn to face the target." But I'm getting tired of having to defend myself for having a positive view on the game. Especially since the team has put in stuff this community has been begging for, for years. As far as the blog goes, yes, that's also the way I read it Road but like KJ and maybe others, the fact that the intent and inspiration stemmed from MUT Team Play, ie User control, gives me pause. It reminds me of the DL moves awhile back and those seeming to be geared towards User control, while the AI/CPU utilization was lacking. So for me whenever I see a feature in Madden that was designed for User control, I'm going to take a wait and see approach to how well the CPU/AI is able to utilize it. That's not suggesting anything nefarious towards EA Tib either, it makes sense to me that something not specifically designed for the CPU/AI could understandably have some bugs or kinks to work out in that regard. I can easily see a scenario where once game play is released that meta game not triggering across the board for CPU/AI. That said I hope it works as described right out the gate because I want to see what a visceral difference, if any, it makes. Yeah I am really impressed with the animations this year. There are a few quirks here and there but this is the first time in I've honestly felt that Madden's animations are on par if not much better with "the other game" in motion. Makes me wonder why they aren't showing gameplay because the game does look impressive if played right. Exactly right. There have been years past where I have seen these gameplay trailers and have thought it could have been made with last years game. I even recall people hyped for a trailer one year and say "I don't think that's this years game. I think its last years gameplay." That's how similar gameplay has looked. I passed on last years game because to me, it didn't look too different from 16. I knew about all the improvements under the hood and work done on special teams, but I wasn't wow'd with the animations. This year is a different story. Whether its the graphics that play a major part or the fact that I haven't played the game in 2 years, but I look at this trailer and don't mistake it for previous years. Animations are much more fluid and interactions are realistic. I'm excited to see more. After looking at the game trailer, I'm convinced that was being shown on the Xbox one and PS4 . It def does not have the detail of the gameplay leaked from E3. With that being said the lighting still looks great and it has me even more excited to see the game on the PS4 pro. Duly noted, as I said in a post a few post later, if this is added as the blog states, it could be a nice addition all the way around. And by the separation he had. This whole outcome is horrid. This. We need sig throwing. At a minimum for the starting QBs. I would also like sig running for backs. That would be so so solid. If the bball game can add 300 something sig shots in a game I'm don't see why 32 sig QBs drop back/throwing animations can't be done. Still no actual gameplay videos? 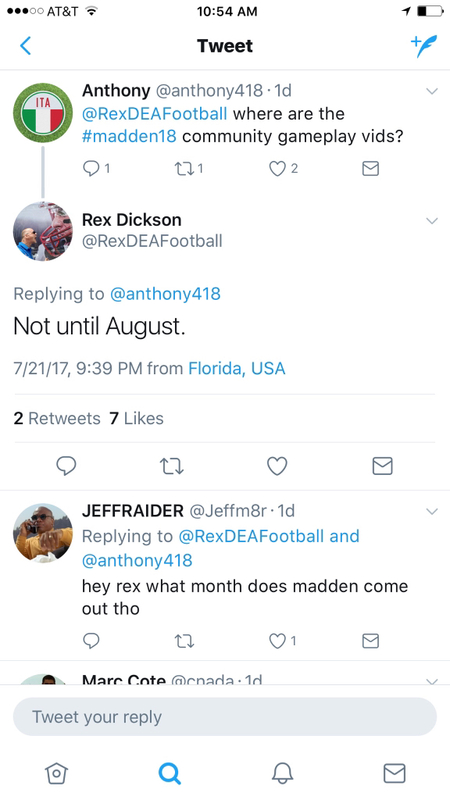 I saw a recent tweet from Rex saying not till August. Lol. U would think early August, but I'm serious, he said August. What are you even talking about? Defend what? I said nothing negative in my post. I just stated that the QB animations in the video were nothing new. How is that being negative? While I agree the game is making strides to look better in motion, I think I need to see more before I make any claims of this being better than any other games in motion. I stopped arguing with people about the QB throwing motions a while ago. Eli's might be more generic, but Brady's is extremely accurate. But I think because someone saw him not plant his foot a certain way in one of the videos that showed him doing it in real life, people are saying QB animations aren't accurate. They got Brady right this year. Brady has more than one throwing animation depending on if he's hurried, throwing a bullet, throwing long, etc. You stated QB animations as something new. I was curious as to what you thought was new. All I did was state that Brady and Eli's animations weren't from what I observed. Brady and Eli's sig throws have been in the game. I never stated that this trailer looked exactly like 17, so I'm not sure I'm the person that can explain that to you. If you're referring to my thread, then you were missing the point of the entire thread. If you weren't talking about that particular thread, then I apologize. But regardless, if I'm not speaking to you, then I'm simply going to throw it out there for anyone. The point I was making was the overall QB throwing motions or their throwing mechanics aren't properly done. The underlying point I was making was that Madden needs to better implement the concept of "drag" and which body part is suppose to move first, second, third, last, including how they execute the follow through. Body parts needs to move and come to a stop at different rates/time so things look more fluid and realistic. Tavaris Jackson (2010) also throws like Tom Brady (2017). The only immediate noticeable different is the way the football is cocked behind their heads, otherwise the followthrough, shoulders leading the hips are either exact or extremely similar as well as the arm position, including the non-throwing shoulder side is not tucked to their bodies. Those are the concerns. Not if the overall motion looks like Tom Brady. Note: the camera angle is positioned a little bit different so the comparison isn't going to be straight on. The "poses" of armatures and the way the body twist are essentially the same. Simultaneous, unison movements of multiple body parts. It's not about whether the throwing motion is exactly Tom Brady. It's whether the execution of that particular throwing motion represents a throwing motion of a human quarterback in general. Even for generic QB throwing motion, it needs to animate properly. You'll never get a QB's hips, shoulders, foot planting absolutely perfect without having all of them come into EA's studio and doing motion capture. It's how FIFA does with their players. Tiburon won't spend that kind of money or take that much time. Not yet anyway. My point is, the throwing motions for not doing motion capture are pretty accurate. EDIT: Throwing motion aren't quite accurate if the shoulders are leading first, causing the hips to move. Then you simply don't understand how animations are done. Do you know how non-motion capture animations are done? The same exact steps as Pixar, Disney, pretty solid youtube animation are done. Does disney use motion capture for their characters. Did Disney attach mo-cap suit onto a clown fish and have him swim around to create "Finding Nemo"? What about the human cartoon charactesr? Do they strap a mo-cap suit around a person and have them "act." The hips are very important to character animation and poses because it's one part of the body that helps convey weight and weight shifts, and is very important for motion. You don't need actual humans to suit up in a mo-cap suit to get the nuances of human movements, or properly implement the 12 principles of animation including drag, etc. It's about moving the arms, body, torso, hips, shoulders, head, neck, the various different armature of the "character rig" into certain position that follows human movement. The following random search on youtube. Do you really think a woman in a mo-cap suit was needed to get the hips to move? The animator simply manipulated the hip into position of his/her 3D model to get that effect. If/when the animator of the following video wants to "polish" his/her gymnastic animations, he/she doesn't need someone in mo-cap suit to "act" out the athletic feat. The animators simply goes back into your keyframe and inbetween frames and using his/her graph editor and whatever other tools at the disposal of that animator to clean it up. If he/she needs to get the animated character's hips to move one way, or footplant a certain way, the animator does it without the assistance of a mo-capped individual. Below (3rd) video. Obviously no need to watch the entire video, but just get a gist of what happens in manipulating the character poses without the need for a mo-cap individual actor. Start @ around 7:20 and notice how the person is manipulating that character rigs body part. That's how you accomplish things without someone in a mo-cap suit. Apply the 12 principles of animations, work on the "drag," etc. Didn't want to quote your entire post, Strawberry, but you can't expect EA to do Pixar type animation with Madden. That stuff costs a TON of money. No game does that and no game will do that any time soon. And even if I'm wrong and it doesn't cost a ton of money, I don't think that type of animation system would translate well to a video game. At least not where we are now with the tech. If that's not what you meant then I apologize. I hope they got a new play by play commentary. The guy in 17 annoyed me. Same guys. Thought they were great last year. They give the ability for commentary updates throughout the year. Just add some commentary that makes you feel like the guys talking are actually following your season! Only updates to Play Now, though. If they added updates to CFM, that would be much better and increase the length of playability for CFM. I've never understood the grip with the last part. I've always heard updates from the previous week. I.E when showing the offensive lineup I'd occasionally hear "this offensive unit was responsible for x amount of touchdowns last week". To me it doesn't make sense to add real world updates to a Cfm you control. They will be releasing commentary updates for CFM this year. Ok, I just hated the way the play by play guy sounds. "1st dowwwwn at the 50 yarrrrrrrd liiiiiiiiiine". The color commentary is great though. The two animated showcase videos below are some of the more impressive works of students created when they were attending animation school, one's from Animation Mentor, the second is from AnimSchool (two of the most popular online animation school). None of these students likely have any affiliation with Pixar or Disney or Dreamworks. You can also run youtube searches for 3D animated shorts and you'll see lots of works that are usually created by a team of members. There are individual solo projects on youtube as well with no affiliation with Pixar, Disney or Dreamworks. Animation comes down to time and the animators abilities. Here's the thing. Pixar, Disney are a different beast in the world of animation. They hire the best of the best of the best. A particular student may be elite in his/her class, he still may never be considered for a position at the Pixar/Disney. More importantly and here's the biggest take home point. Yes, Pixar/Disney have perfected the 12 principles of animations. But even just average or simply sufficient animation should really embody the 12 principles of animations to a certain level. It doesn't have to be Pixar/Disney perfection, but there is a baseline that should be met so the animation itself doesn't miss the mark on creating believable realism. Off the top of my head, two examples of games that have implemented the 12 principles of animation well: (1) Pro Yakyuu Spirits and (2) Rugby Challenge. Both of the player movements as can be seen in the GIF below exude human movements that are believable, approaching extraordinary realism. Madden, another example where the realism unfortunately falls short is their walking animation and kicking animations. It doesn't take Pixar/Disney professional level animators to get this aspect corrected. Student animators should be able to recognize the discrepancies between real life and madden's movements. (1) Walking: Madden player's don't walk upright. Their legs are bent; they're walking in a quarter squat position. (2) Kicking: Madden's kickers have bent legs during their kicking game. Using reference footage (i.e. real life NFL footage), when an animator looks to animate the kicker, the animator looks for key poses and attempt to replicate that. A kickers initial "set leg" is straight as he sets himself a few yards before the kick. As the kicker physically kicks the ball, the animator would also see that the leg used to kick the football is also straight on follow through. Maddens' kicker's leg as mentioned are bent, both at the set and kick position. This doesn't take Disney/Pixar level talent to see when compared to real life reference footage. Observe the following gifs, both are from video games. Which has the believability factor that the animators were trying to accomplish? Which looks more realistic. Rugby Challenge created by a small time company I believe. I'm not a developer, but I don't think it would take this level of animation. Why can't they just have who ever normally puts on the mo-cap suit watch a few videos of qbs throwing and imitate it? Not to bring up that other game, but APF had some animations of Randall Cunningham that were dead on from some of his classic plays. I doubt he came in and mocapped for them. Always figured that's how they got it in the game. Lol. Gaudin is more of a radio guy. I actually like that and think he's the best play by play guy they've had in madden. I think a lot of people liked the commentary from last year and their overall commentary 'plan' I think includes the same guys for awhile. Even MLB the Show misses the mark when it comes to their animations. Pitching and throwing has been their legacy issue. Would you consider Pro Yakyuu Spirits' to be classic examples Pixar/Disney animations or simply something that have embraced the 12 principles of animations and created believable, realistic animations in a video game. What specifically is wrong in the show example? Watch the show in slow motion. The pitchers arm moves first and the hips/torso follow. I agree 100%. The Show does a great job of imitation signature styles. Once would think Madden would be able to do the same. Now is there something holding this back? Possibly. Maybe with the frostbite engine this will be possible next year. 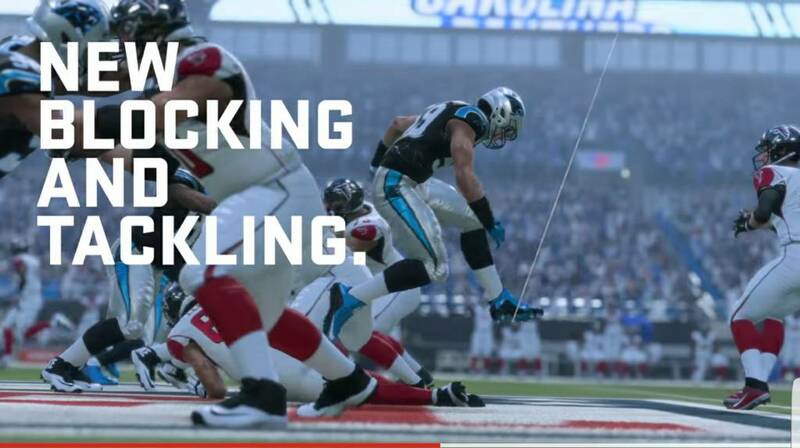 We all know Madden is built on a shaky foundation. I just think they really have to make animations a priority one year across the entire game. Like the play action stuff they added looks great, along with alot of the spectacular and jump ball catches. Just mixed in with the old stuff throws off the appearance of the game. Along with adding alot of little stuff, like the preplay fidgets and what not that look good too. Great post Strawberry re maddens poor animations and bent leg walking. No reason for Madden to still be like this way, unacceptable. Aye, strawberry, you can you put that thesis of a post with all the gifs in spoilers next time, please? Good looking out. Done. Went back and re-edited my post with spoiler tag. I'm going to reserve my breakdown for The Show forum maybe later this month or next month. I'm trying to put together some visual examples. But briefly, it's more than just the hips and shoulder rotation discrepancies. MLB the Show pitcher's are missing or have incorporated the "pitcher's triangle" incorrectly, the start position of the pitchers' body tilt has a backwards lean when realistically there should be a forward lean, their glove side arms aren't tucked resulting in a pterodactyl winged like effect, the pitcher's are entirely too upright missing the stretch curvature, arm whip and recoil speed of the entire body is off, and as alluded to earlier hip and shoulder rotations aren't done properly because they rotate simultaneously towards home plate (arms/shoulders are suppose stay back or rear back as the hips are rotating forward). That's a general gist right now. Further elaborations will come at a later date in the The Show forum. Real world updates to CFM doesn't make any sense which is why last year's decision to focus all the updates on real world stuff was a mistake. Basically everything they updated with last year is completely trashed and useless this year. So in regards to Madden 18 it was a waste of time. CFM updates and the commentary updates in general should work to make overall commentary better and do things like making sure every player name in the game is spoken and adding stuff that can be used for years to come. I didn't mind the commentary at first but ended up muting it after a while which was a first for me. There's still a ton of dead air combined with times where Charles Davis will go on a two or three play rant about a four yard pass or something. Somebody wake me when they actually show some game play footage. Also , I hope they demo their new "features" in the game play videos actually working. PS, I hate Sizzle trailers. I always appreciate your feedback but in the future can you please add something of value to the conversation or just abstain from posting? Really doesn't add anything to the conversation with a post like this. Looks like the QB flack jacket has been updated. Now for the long version of this post. The Trailor which is the topic of the post is like every madden trailer that has come before it. Zoomed in footage of the game in camera angles no one will never play in, flashed across the screen at various speeds and at 1 to 3 second lengths. Do take note that the actual gameplay camara shots are really short. I reckon for the ones with short memories and don't recall trailers past and relate them to the game they actually played when they got it, also forget that what you see in sizzle trailers is 30% of what you gonna have when you actually are playing the game. If that. I'm sure there are those that feel different. Nothing wrong with that. They have a right to come here and post that view. However short or long they want. That said. I sure do hope they show some video in the near future, that shows off the game doing all the things they are hyping in the blogs. I don't think that's too much to ask. Marvel vs capcom ain't out until September and not only do we have footage, we got a demo. That's confidence in your product. Axis football 18 has even got gameplay footage out and his game ain't triple A quality yet but at least he showing what he got. I like when companies show off their game. I hate the sizzle trailers. I don't know what else to say about a trailor that shows you very little that won't get my short comments about it flagged and then encouraged to just keep my opinion to myself.........on a public forum. I thought that was what the ignore button was for... when a person posts stuff that makes you feel sad and you can't debate them or care to you hide from them. So that all points of view can still be heard even if you don't want to hear nothing but your point of view. Don't want you to keep your comments to yourself which is why I encouraged more. I always enjoy your stuff. And I can't use the "ignore" feature, not that I would anyway in your case.